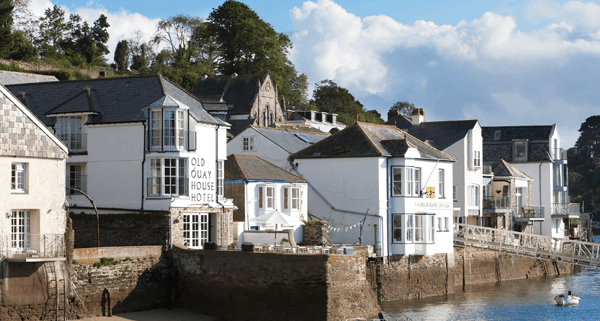 Why not treat your partner to the ultimate in indulgence at one of Cornwall’s luxury hotels, The Old Quay House. Arrive at the hotel and you will be welcomed by our staff and then shown to your room where a bottle of Veuve Clicquot champagne in your room on arrival. Then why no take a stroll hand-in-hand through Fowey’s pretty narrow streets, browse the boutiques and galleries, or take in the scenery with a walk along the picturesque coastline? Then in the evening enjoy dinner at the hotel’s acclaimed restaurant ‘Q’, which serves up a creative menu of seasonal dishes prepared using the best local produce. This is a 2 night break and will include the champagne on arrival, 2 nights accommodation for 2 people including breakfast and dinner for 2 on 1 night in ‘Q’ restaurant. Prices start from £425.00, call 01726 833302 now to book.